Iluzjonista pokazuje widowni lalkę, i kładzie ją na swojej dłoni. Jeden magiczny gest, i lalka ożywa i wstaje z jego dłoni!-Lalka ma 5 x 6,5 x 0,5 cm.-Żadnych sznurków, magnesów, pinezek. Jeśli chcesz, możesz dać ją do sprawdzenia widowni. 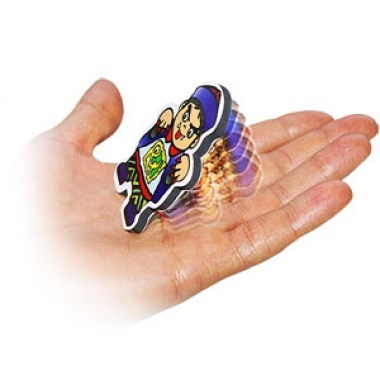 The magician shows the audience a doll and immediately after he lays it on his palm. At this point, with a magic gesture the doll comes to life and stands up from the hand of the magician. - The doll measures cm 5 (l) x 6,5 (h) x 0,5 (w) about (in. 2 x 2,55 x 0,20). - There are no strings, magnets or pins, if you want you can give it out for examination.